Vibracussor percussion therapy is an exciting treatment approach for muscle and ligament problems and related myofascial conditions that we utilize here at the office. Used by many professional sports teams, Vibracussor effectively enhances rehabilitation and helps reduce pain and discomfort among their top players. The Vibracussor delivers waves of percussive impulses deep into the tissues of the body. These percussion waves promote an increase in circulation and lymphatic flow and a decrease in muscle spasm. Vibracussor therapy is very effective for relaxing muscles. It can be used to warm up muscles and setting proper tonus prior to athletic events. It can be used following an event or exercise to flush muscles and minimize soreness. 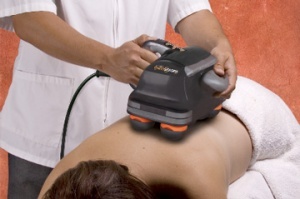 The Vibracussor is also highly effective in treating fascial restrictions of the shoulder, hip, and knee joints. It often helps frozen shoulders become mobile in just a few visits. It is also very helpful with scars and adhesions associated with surgery.